Gold reversed its downward move during yesterday's session and continues to do so this morning following the European Central Bank meeting and Draghi's press conference. On top of that, economic data from the US failed to boost the greenback and lower US yields also supported the move in favor of the yellow metal. Gold prices reverse every time they dip below the $1280 level and that shows that the bulls are still in control and that Gold is well supported especially around this area. 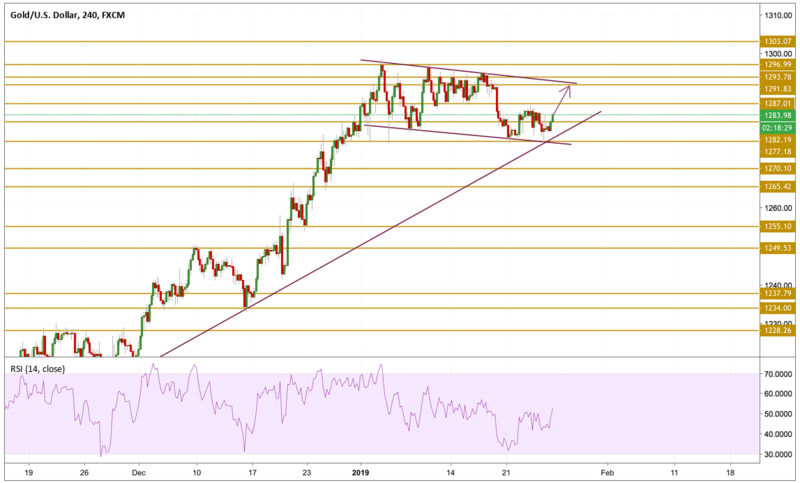 The flag presented on the chart continues to prove that it is still valid after another dip in gold prices towards the lower band and another support provided by it. Prices bounced back above the $1280 level and are now hovering just below the $1284 level. With the upward move picking up its bullish momentum, we will be focusing on the upper band of the flag now and precisely we will be watching the $1291.8 level.